The 15th of each month at 12 o’clock sharp Paris time, we post a photo on a specific theme chosen by one of the members of Photo of the Month, a group of worldwide amateur bloggers and photographers. That’s a good opportunity for us to share our photos and best travel memories with you. The theme of this month is silence, chosen by Sinuaisons. Phew… I thought I could make it easier than that. But I actually found it quite difficult to illustrate silence. I first browsed our photos of Asia, but Asia is anything but silence. It is noisy, crowded, lively but not quiet. And then I thought of Japan. Which is another Asia. Quieter in some aspects. I remembered the silence of Zen gardens in Kyoto. 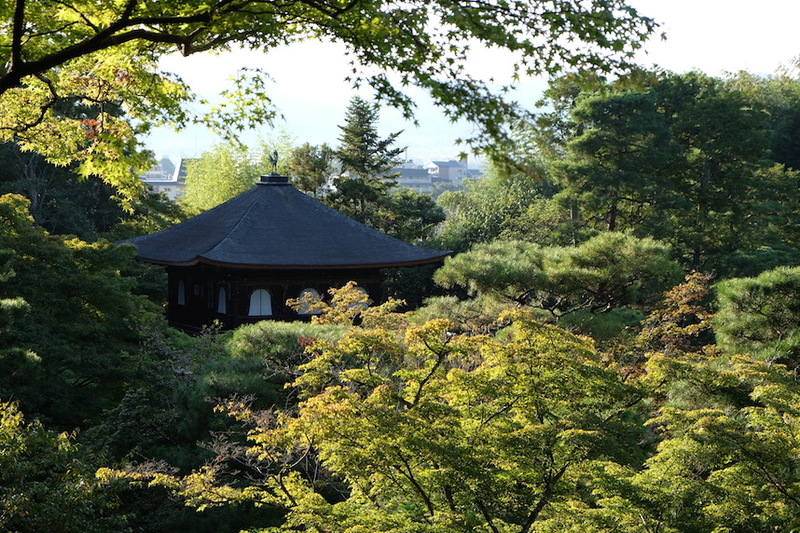 This photo shows the Ginkaku-ji Temple – or Silver Pavilion, one of Kyoto’s most famous temples. Its Zen garden is fabulous and amazingly peaceful. I could easily spend the whole day wandering around its alleys. The Zen garden is composed of a dry garden (stone garden) with an iconic cone-shaped pile of sand, and of a stunning green garden all around, harmoniously arranged with all kinds of delicate trees, mosses, flowers, as well as small and bigger plants. It’s simply amazing! The back of the garden is a bit higher, so it is possible to walk up to see it from above, as on the picture. At sunset, colours turn gold, and it is heavenly beautiful and relaxing. Nicky, Chat bleu, Kenza, Testinaute, Morgane Byloos Photography, Lair_co, J’habite à Waterford, Dr. CaSo, Philae, Tuxana, Wolverine, Pilisi, Estelle, La Tribu de Chacha, KK-huète En Bretannie, Giselle 43, Calamonique, Escribouillages, E, Krn, Xoliv\’, écri’turbulente, Sous mon arbre, Gine, Lilou Soleillant, Renepaulhenry, Brindille, La Fille de l’Air, Alice Wonderland, Cécile, Céline in Paris, Luckasetmoi, Sense Away, The Beauty is in the Walking, Lyonelk, DelphineF, Philisine Cave, Danièle.B, Evasion Conseil, Lavandine83, Eurydice, magda627, Je suis partie voyager, Noz & ‘Lo, Alexinparis, Autour de Cia, Alban, Lau* des montagnes, Mirovinben, Mon Album Photo, Who cares?, Josiane, Mamysoren, Aude, Christophe, Gilsoub, Akaieric, Nanouk, Frédéric, Angélique, BiGBuGS, François le Niçois, Koalisa, Cricriyom from Paris, Sinuaisons, Chiffons and Co, El Padawan, Tambour Major, CécileP, Blogoth67, Champagne, Josette, Lavandine, Laurent Nicolas. What does silence inspire you? Difficile pourtant, le silence dans un jardin… mais le bruit de la nature apaisée est peut-être une sensation de silence? Absolument ! Rien n’est vraiment silence tant qu’il y a de la vie, mais lorsqu’on est loin du bruit de la ville, on a cette impression de silence et d’apaisement. C’est ce que je veux montrer du silence.